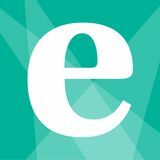 Partner with leading physicians at Emory University and help make discoveries that will change our understanding of aging and age-related diseases for generations to come. Your participation is completely online. Periodically take surveys and play games. It takes only 22 minutes to join. the Arts tickets and see content that comes alive in each issue. Download or update the app and start scanning now. Copyright 2017 AMP Inc. All rights reserved. Reproduction in whole or in part is strictly prohibited. Encore Atlanta is a registered publication of AMP Inc. The publisher shall not be liable for failure to publish an ad, for typographical errors or errors in publication. Publisher reserves the right to refuse any advertising for any reason and to alter advertising copy or graphics deemed unacceptable for publication. Hotel Indigo Atlanta Downtown A unique, boutique experience. 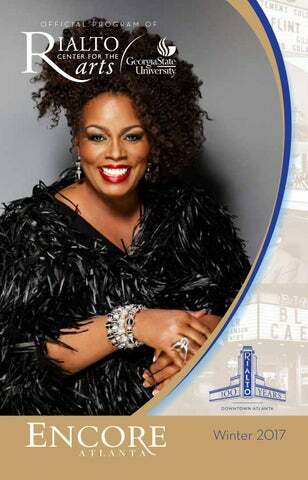 Dianne Reeves Rialto Fan Favorite! Che Malambo Muy Macho Men! “Straighten Up and Fly Right” soared up the charts in 1943. As a singer, he was called “the best friend a song ever had,” but he was essentially a jazz performer at heart. Even those later tracks crafted for the pop charts belie a piano technique, vocal phrasings and on-the-mark orchestration that are indebted to his early roots in jazz. RAMSEY LEWIS and JOHN PIZZARELLI have crafted a tribute to the titan of ’50s vocal pop, from his hits along with those singular tracks of sophisticated cool jazz that have influenced their own careers. the river — from its sources beyond Lake Victoria to its delta in Egypt — have learned new musical modes, while buzzing timbres and ingenious polyrhythms support vocals in more than 10 languages. Instruments that parted ways millennia ago are reunited and pushed into new places. Love songs have crossed geographic and linguistic barriers to forge new, close friendships. Using music to spark cultural curiosity, the Nile Project engages musicians and audiences, encouraging them to feel connected to the world’s longest river and to explore new approaches to its large-scale social, cultural, and environmental problems. Dailedys Carrazana and Fernando Saéz, and consists of 10 dancers. Its repertory includes 24 Hours and a Dog and Farewell by Delgado, both set to music by Grammy Award-winning Cuban-American composer Arturo O’Farrill (who wrote an original overture for the piece, of the same name). It also includes the original commissions Why You Follow by Ronald K. Brown and Under Fire by Trey McInytre, among other works. MALPASO DANCE COMPANY An Associate Company of Joyce Theater Productions EXECUTIVE DIRECTOR AND CO-FOUNDER . . . . . . . . . . . . . . . . Fernando Sáez ARTISTIC DIRECTOR AND CO-FOUNDER . . . . . . . . . . . . . . . . . .Osnel Delgado ASSOCIATE ARTISTIC DIRECTOR AND CO-FOUNDER . . . . . . . Daileidys Carrazana BALLET MASTER . . . . . . . . . . . . . . . . . . . . . . . . . . . . . . . . . . Dailys Bacallao STAGE MANAGER . . . . . . . . . . . . . . . . . . . . . . . . . . . . . Diana Rosa Hernandez PRODUCERS . . . . . . . . . . . . . . . . . . . . . . . . . . . . . . . . . . . . . Ilter Ibrahimof Barbara Frum PRODUCTION AND COMPANY MANAGER . . . . . . . . . . . . . . . . . .Steven Carlino LIGHTING SUPERVISOR . . . . . . . . . . . . . . . . . . . . . . . . . . . . . Manuel De Silva DANCERS . . . . . . . . . . . . . . . . . . Dunia Acosta, Maria Karla Araujo, Michel Avalos, Fernando Benet, Daile Carrazana, Osnel Delgado, Manuel Durán, Beatriz García, Claudia Molinet, Abel Rojo, Lisbeth Saad This engagement was made possible in part by Joyce Theater Productions, an initiative of The Joyce Theater Foundation in partnership with Sunny Artist Management that supports select projects from inception to premiere and subsequent tours. Artistic director Osnel Delgado graduated as dancer and professor from the National Dance School in 2003. He was a member of Danza Contemporanea de Cuba (DCC) from 2003 to 2011. He has received major Cuban awards including the Premio a Mejor Coreografia del Concurso Solamente Solos (Award for Best Solo Choreography), el Premio Ramiro Guerra (Ramiro Guerra Prize), as well as a special mention award at the VII Iberomerican “Alicia Alonso” Choreography competition in Madrid. Delgado has worked with such choreographers as Mats Ek, Rafael Bonachela, Kenneth Kvanstrom, Ja Linkens, Itzik Galili, Samir Akika, Pedro Ruiz, Isidro Rolando and George Cespedes, among others, and has created works for DCC, Rakatan and Ebony. He is a professor of dance at the National Dance School in Havana, Cuba. rammy Award-nominated and globally renowned a cappella ensemble Sweet Honey in the Rock continues to cultivate, evolve and add memorable moments to its members’ indelible legacy as activists and artists. They have stayed true to their mission to educate, entertain and empower their audience and community through the dynamic vehicles of a cappella singing and American Sign Language interpretation. Last year they released their first album principally comprised of original songs, #LoveInEvolution, which was critically acclaimed and featured their collective voices and prowess as stunning vocalists and compelling songwriters. Touching on the culturally complex relevance of our times — social justice, human and civil rights — the album integrated many of the complex sounds of such African-American musical genres as blues, spirituals, traditional gospel hymns, rap, reggae, African chants, hip-hop, ancient lullabies and jazz improvisation, which have contributed to Sweet Honey’s patented core style. The singers continue to stretch their artistic boundaries as live performers to produce a sound filled with their soulful four-part harmonies and intricate rhythms, accompanied by hand percussion instruments and bass (acoustic upright and electric). alé Folclórica da Bahia (BFB), the only professional folk dance company in Brazil, was formed in 1988 by Walson Botelho and Ninho Reis and has achieved considerable success in its short history. Under the artistic direction of José Carlos Arandiba, the company’s many national and international tours have earned it a prestigious reputation throughout the country and abroad that is reflected in the response of the public and the critics. The 38-member troupe of dancers, musicians and singers performs a repertory based on a “Bahian” folkloric dances of African origin and includes slave dances, capoeira (a form of martial arts), samba and those that celebrate Carnaval. The company presents the region’s most important cultural manifestations under a contemporary theatrical vision that reflects its popular origins. *Major funding for this organization is provided by the Fulton County Board of Commissioners. This program is supported in part by the Georgia Council for the Arts through the appropriations of the Georgia General Assembly. GCA also receives support from its partner agency – the National Endowment for the Arts. stylings, Reeves has received five Grammy awards for best jazz vocal album and an honorary doctorate of music from Juilliard. Her magical, timeless voice, exceptional personality and the sheer force of her performance mark her as a captivating world-class artist. “She has one of the most powerful, purposeful and accurate voices of this or any time,” jazz trumpeter and educator Wynton Marsalis has said. Reeves’ recent Grammy Awardwinning album, Beautiful Life, epitomizes the spirit of her storied and extraordinary career, traversing many genres and collaborating with a diverse collection of artists. Adored by audiences and critics throughout the world, Reeves is a natural wonder not to be missed. She will be joined by her outstanding musicians Peter Martin, Romero Lubambo, Reginald Veal, and Terreon Gully. YOUR FRENCH CONNECTION IN ATLANTA FOR FRENCH CLASSES AND FRANCOPHONE CULTURES AROUND THE WORLD . ¢ Cdelivers.com/subscribe Go to AJCdelivers.com/subscr Read the digit Explore exclusive digital extras, Explore exclusive digital extras, Explore exclusive digital extras, breaking news throughout breaking news throughout the day the day breaking throughout the day and interactive databases with myAJC. and interactive databases withnews myAJC. Your digital subscrip email updates Yourdaily digital subscription includes daily of email updates and can be Read the digital edition the complete accessed on any de daily newspaper with AJCePaper. accessed on any device, any time. Offer for new subscribers only. See complete and other subscription options at AJCdelivers.com/subscribe Offer available foravailable new subscribers only. See complete details and details other subscription options at AJCdelivers.com/subscribe. Offer available for new subscribers only. See complete daily email updates and can be details and other subscription options accessed on any device, any time. Dolby® Surround Sound and Projection Equipment in the theater has been provided by Turner Broadcasting System, Inc.
TICKETS Tickets available for purchase by phone at 404.413.9TIX (9849), online at rialto.gsu. edu, or in person at the Rialto box office, 80 Forsyth St. NW (corner of Forsyth and Luckie streets). BOX OFFICE HOURS Monday-Friday, 10 a.m.-4:30 p.m. WEBSITE Visit rialto.gsu.edu for a complete calendar of events or to purchase tickets 24 hours a day. REFUNDS & EXCHANGES All sales are final with no exchanges or refunds. Patrons may return tickets before a performance and receive credit for a taxdeductible donation. USHERING Interested in volunteering as a Rialto usher? Sign up online or call 404.413.9845. PARKING The Equitable Building parking deck at the corner of Fairlie and Williams streets, provides official parking for the Rialto Center. SPECIAL NEEDS The Rialto Center is fully accessible to patrons with special needs. Wheelchair seating can be reserved in advance. Patrons who are TTY users, hearing impaired, speech disabled or hard of hearing can call us through the Georgia Relay Service at 711. For more information about these services, please call 866.787.6710. You can also email us at info@rialtocenter.org. IN CASE OF EMERGENCY The exit sign closest to your seat shows the shortest route out of the theater. In case of an emergency, please walk to the exit. ETIQUETTE Smoking is permitted outside only. Please turn all cellphones and electronic devices to silent operation. Late-arriving patrons will be seated at the House Managerâ&#x20AC;&#x2122;s discretion during a pause in the performance. Please refrain from talking during the performance. CAMERAS/RECORDING DEVICES The use of cameras or sound/video recording equipment without the written permission of the management is strictly prohibited. LOST AND FOUND For items lost or left at the theater, please call the House Manager at 404.413.9844. MERCHANDISE The Rialto has items available for purchase at the box office including umbrellas, coffee mugs and more. RENT THE RIALTO Our state-of-the art facilities offer the perfect setting for everything from a VIP reception to an unforgettable corporate event. For more information, please contact Jo Costanzo at 404.413.9814 or jcostanzo@gsu.edu.